The food I begged for as a child and never got? As a child of the 80s and 90s, I thought chocolate cereals — Cookie Crisp, Cocoa Pebbles, Cocoa Puffs, Count Chocula — must be the greatest breakfast ever. I remember begging for those chocolate cereals when I went to the store with my mom. Now that I'm a big kid, I'm still enthralled by the thought of chocolate for breakfast, though I have ZERO desire for processed chocolate chip cookies in a box. 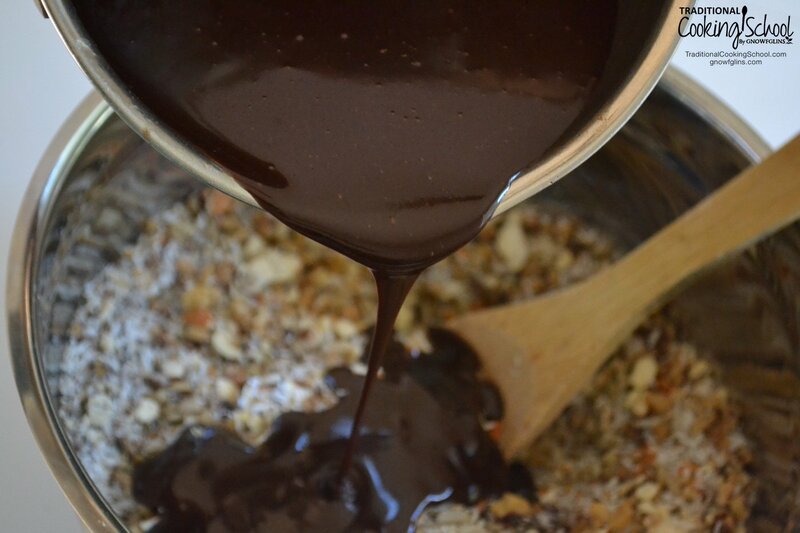 So I created this grain-free, gluten-free, and refined sugar-free Paleo Chocolate Granola. Nutritional inhibitors and toxic substances found in nuts, grains, and seeds can be minimized or eliminated by soaking. These inhibitors and toxic substances are enzyme inhibitors, phytates (phytic acid), polyphenols (tannins), and goitrogens. … Enzyme inhibitors will clog, warp, or denature an active site of an enzyme. … Soaking allows enzymes, lactobacilli, and other helpful organisms to break down and neutralize a large portion of phytic acid in grains. Soaking in warm water also neutralizes enzyme inhibitors, present in all seeds, and encourages the production of numerous beneficial enzymes. The action of these enzymes also increases the amount of many vitamins, especially B vitamins (source). Soaking nuts and seeds not only breaks down hard-to-digest enzymes and phytic acid, but it also encourages the production of beneficial enzymes which further aid in digestibility and increase nutrition. By keeping the nuts and seeds raw through the entire process, you are ensuring even greater nutrition in your food by leaving the beneficial enzymes intact. Raw cacao — both the powder and the nibs — are FULL of free radical-destroying antioxidants. Free radicals damage DNA, causing premature aging and even cancer. Cacao nibs are the most unprocessed form of raw cacao, therefore they are the most concentrated source of these beneficial antioxidants. Did you know cacao can stimulate the brain to release neurotransmitters that can trigger happy, feel-good hormones and give us a sense of alertness and well-being (source)? I think that's a good enough reason to eat chocolate granola first thing in the day! Again, all of these good enzymes, antioxidants, and added vitamins are only achieved through properly soaking and drying the nuts and seeds and keeping the granola raw throughout the entire process. I won't lie — this recipe is a bit labor-intensive. 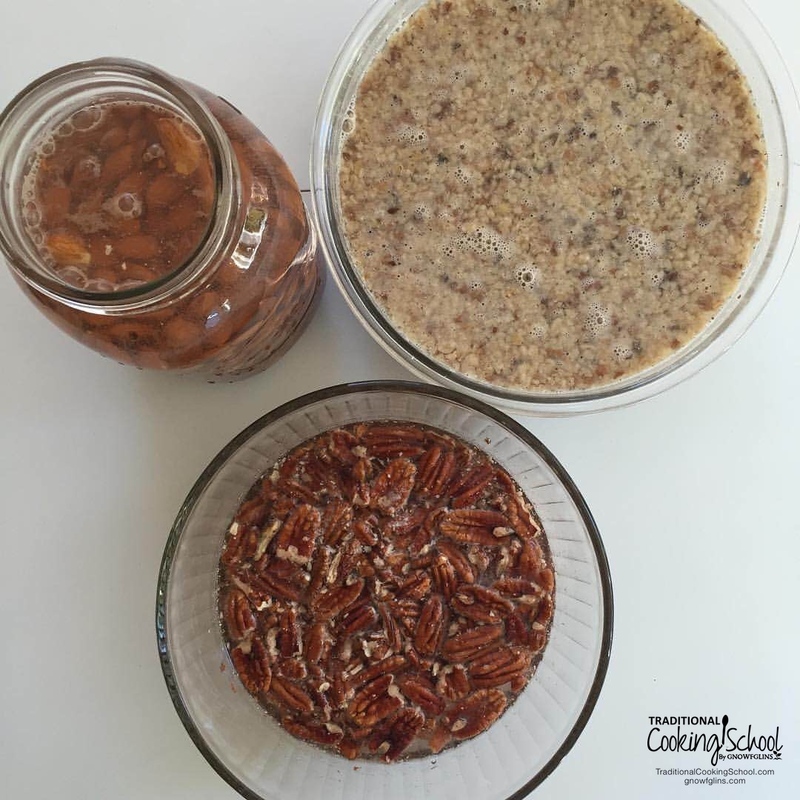 It's not hard by any means, but it does require you to plan ahead by soaking and dehydrating your nuts and seeds AND THEN to wait an additional 8 to 10 hours for the granola to dehydrate again. Not much hands-on time, but quite a lot of waiting time, which can be difficult when you just. want. a. bowl. of. cereal. That's why I created this recipe to make a lot o' granola: 12 cups to be exact, at least 24 servings. The end result is well worth this labor of love. Having chocolate for breakfast may not be something you do all the time, but I can see this recipe being one of those that you serve a special someone on their birthday or have on Thanksgiving morning when you need something quick but out of the ordinary. The thing about a nut-based granola is that a little goes a long way. You won't have to eat an entire cereal bowl (or two) before you feel satisfied, like with commercial breakfast cereals. It's loaded with good fats and protein, so don't let the fact that there's chocolate in your breakfast make you think that it's not good for you. Don't want to serve chocolate cereal for breakfast? Use it as dessert or topping for yogurt or ice cream instead! The food I begged for as a child and never got? Chocolate cereal! This grain-free, gluten-free, and refined sugar-free Paleo Chocolate Granola fits the bill. Makes 24 servings. Serving size = 1/3 to 1/2 cup granola with milk of choice. Soak and dehydrate all nuts and seeds if you haven't already. See full instructions here! Pulse whole walnuts in food processor until about the size of gravel, then measure out 2 cups. Then repeat with almonds and pecans. Combine all dry ingredients into a large mixing bowl and stir to combine. In a small saucepan over medium heat, combine honey, coconut, and cacao powder, whisking constantly. When the mixture comes together and is smooth, add vanilla and salt. Then remove from heat and pour into combined dry ingredients. Stir well so chocolate sauce coats dry ingredients. Lay parchment paper onto dehydrator trays and spread the granola mixture out evenly on the trays. Dehydrate for 10 to 12 hours at 110 to 115 degrees Fahrenheit. When the mixture is cool, transfer back to a large mixing bowl and use a wooden spoon to break up any large chunks. If desired, fold in a half cup of chopped, allergy-free chocolate chunks — again, chop first, then measure. Finally, store in a cool location in an airtight container. Note that using a dehydrator on a low setting for the entire process locks in all the nutrition and enzymes of raw, soaked nuts and seeds and raw honey and the antioxidants of raw cacao and cacao nibs (source). If using an oven instead, be aware that the lowest temperature setting of most ovens is 170 degrees Fahrenheit. The enzyme content of granola made in the oven may be less than when made in a dehydrator. I don't like super sweet chocolate. Rich, dark chocolate is what I want, and this granola delivers. 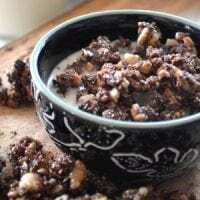 The addition of antioxidant-rich raw cacao and cacao nibs gives this cereal the pleasant bitterness of chocolate, while the raw honey balances it out with a slight sweetness. Do you like granola? What do you think about chocolate cereal for breakfast? This post was featured in 90 Nourishing Egg-Free Breakfasts and The Great Granola Round-Up: 31 Deliciously Nourishing Recipes! Oh my! This looks tremendous! The chocolate wooed me; the sprouted nuts won me over! Love this idea! I’ve been wondering about cocoa power…is it high in physic acid and does it need to be soaked somehow? I’m OK with letting a little slip in if everything else is soaked, but I was curious since I tend to use it a LOT and am wondering if it’s harmful to do. Also, how bad is the cheap store-bought (non-raw) cocoa? Thanks. How awesome! I miss the crunchiness of cereal. However, real chocolate kills me! My tongue swells. I’m doing this and maybe adding dried fruit pieces and maple syrup? yum!! Thank you! So, should the China seeds be soaked also? How would that work? Don’t they get all….gloppy? Any suggestions on how to make it THM friendly? This would be a perfect S, but for the honey! I was thinking the same thing and pondering the use of trim healthy momma chocolate chips to make it work. What do you think? The soaking of nuts link in detail is not working. And I am a bit confused about chia seeds. Wont they become a sticky mess if you add water to it. Can you explain(add few more steps) about chia seeds.